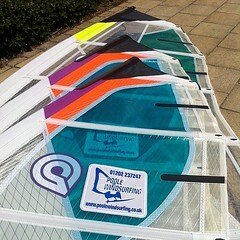 The start of another great summer of windsurfing is almost here! The 30th April will be the opening day of the season at the Poole Windsurfing school and we are unwrapping lots of brand new windsurfing equipment from Goya, RRD, Amex & Billabong ready to be used by those who book early for windsurfing lessons and windsurf hire. It is the prefect time to start learning how to windsurf or get back into the sport after the winter, giving you the whole summer to progress your skills. The water temperatures are just starting to warm up by then and the days are getting longer, making it a more enjoyable experience to get out there on the water. During the coming season all types of windsurfing lessons will be running, from beginner and intermediate windsurfing courses through to advanced lessons and private windsurf tuition. 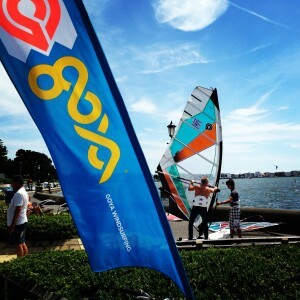 Also, Poole Windsurfing will continue to offer their ever popular windsurf hire scheme where you can pay by the hour or take advantage of a discounted 10 hour hire card that you use during the course of the summer season. Our policy of replacing kit every year continues, with the latest 2016 RRD Evolution V3 boards in new Duratech construction, more Goya Surf 200lt beginner boards & RRD Easyrider 180lt beginner/improver boards. Our advanced windsurf sails are being replaced with the latest top of the range 2016 Goya Guru & Nexus sails – these are the same models as the pro’s use! To keep you warm out on the water we will be topping up our fleet of Billabong wetsuits with brand new Intruder models and we always have wetsuit shoes and buoyancy aids to ensure you have maximum comfort & safety when out windsurfing. Absolute top quality windsurf equipment & great instruction on your windsurfing lessons will set you off in the right direction this coming summer. RDM (Reduced Diameter Masts) are still being used exclusively throughout our windsurf school. You rarely go to a windsurf school that uses these masts for their students, they are normally only reserved for the instructors! At Poole Windsurfing we use RDM’s for everything from advanced sails right through to using them on our beginners windsurfing courses! For a more detailed look at all the brand new windsurfing equipment you will be using this summer take a look on our Windsurfing Equipment Page. This page showcases our windsurfing equipment and will be updated with shots of all the 2016 windsurfing kit as soon as it is unwrapped ready for the start of the summer season. Book up your windsurfing lessons or windsurf rental now and be some of the first to try out the latest 2016 windsurfing equipment. 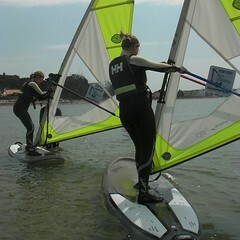 Hope to see you during the summer & happy windsurfing!